Net Guard, Free Bandwidth Monitor, Bandwidth Meter, Monitor Broadband Usage for Free! 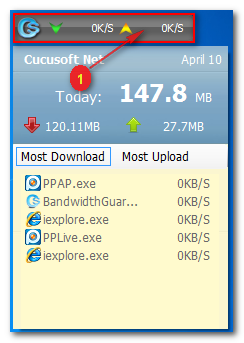 Cucusoft Net Guard is a freeware that allows you to monitor your broadband usage, maximize your internet speed and eliminate any malware which might be consuming your bandwidth. It also provides you a monthly detailed Bandwidth Usage Report. Currently, this kind of software is sold for $30 or more with less features compared to ours, but we at Cucusoft , will give it to you at no cost at all. We also GUARANTEE that there is no virus, no spyware, no adware and no malware in our software. 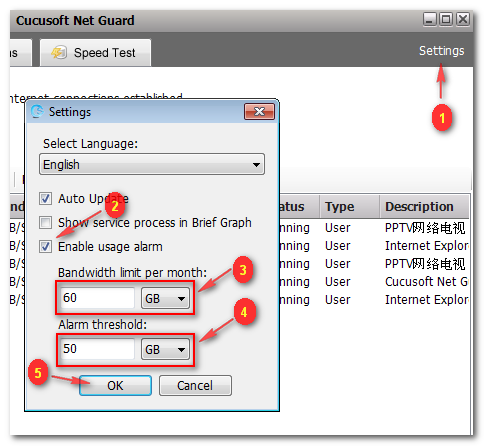 Cucusoft Net Guard includes a powerful Bandwidth Monitor and Bandwidth Meter to help you find what could be misusing your bandwidth. Are you wondering why sometimes even when you didn't even use your internet, there are still some unknown programs utilizing the Broadband in your computer? Those unknown programs which are wasting your bandwidth can affect your normal internet surfing speed and worst, even make you pay a higher Broadband Bill because it made you exceed your limit. Now, we offer a solution to your problem by using Cucusoft Net Guard. This program can easily monitor your broadband usage. It can help you find what is eating up your broadband and how much bandwidth they are consuming. Also, with more details statistics available, you can easily make a well informed decision by just checking the simple report if whether you want to keep it or stop it. That means you have full control as to whom you want to give access to your Broadband. 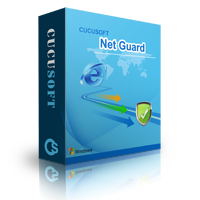 Incredibly, Cucusoft Net Guard’s features are not limited to those mentioned above. It also includes a Powerful Graphic Bandwidth Usage Report, a bandwidth usage prediction and over limit Notification, broadband speed test and so much more. Donate Now! Please support us! Market value is $30.00 or more, here you can get it for FREE: $0.00 If you are satisfied with this software and hope that our developers can continue to update it and make it even better, you may support us with your donation and we will forever be grateful to your kind gesture. Donate Now! Do you want to know the ways as to how Cucusoft Net Guard can help you save money? 1. Cucusoft Net Guard can monitor what is using your Broadband and the amount of traffic they consume. It can give you a detailed report regarding which program/s is using your broadband. (No need to worry about your personal privacy concern as it just simply checks how many bytes is used for uploading/downloading via Broadband. It does not check and save the content in any Internet Data packages.) Click here for further details. 2. You may set a traffic limit per month. Net Guard will notify you before your bandwidth usage reaches its limit so you can manage the use of your broadband in the future to avoid Extra Usage Bill. Click here for further details. 3. 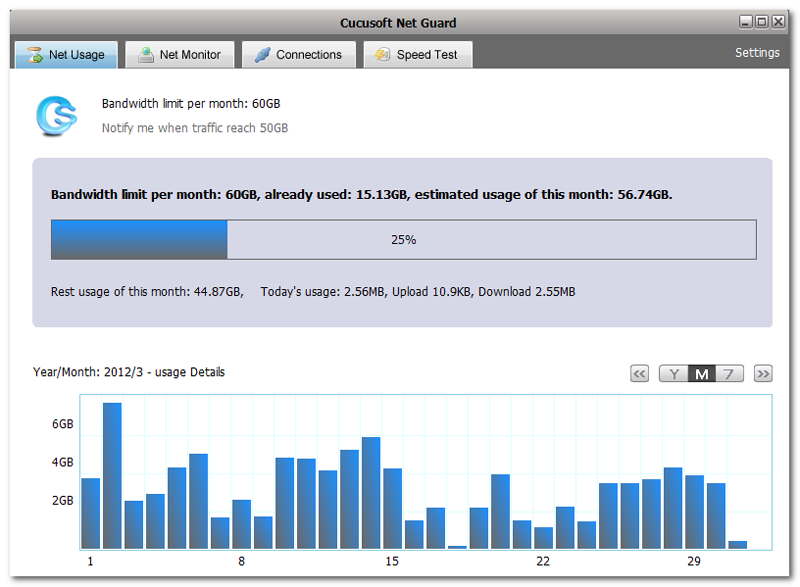 Cucusoft Net Guard has a forecast feature that automatically calculates the projected bandwidth for the current month. This feature gives you a heads up as to whether your usage will exceed your monthly limit. . Click here for further details. 4. If you find a suspicious program utilizing your Broadband and misusing your data transfer rate, we give you the power to terminate it to save your bandwidth usage which will make you surf the Internet faster and smoother. Click here for further details. 5. You will be conveniently informed as to which program comsumes most traffic, per week and per month. Click here for further details. 6. It records traffic details daily and you can quickly check the previous months’ records and so on. Click here for further details. 7. 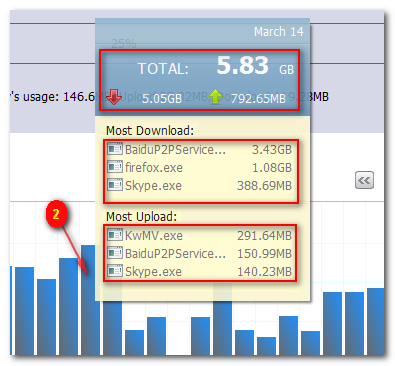 You can easily check the current upload and download bandwidth usage. Click here for further details. 8. It includes a small real-time floating window which indicates the real-time Internet uploading and downloading speed. 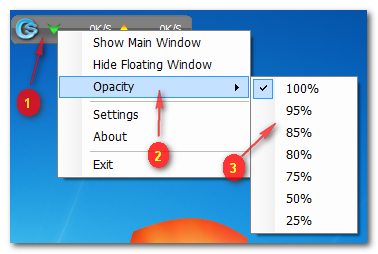 You have the option to hide or adjust the window's opacity to make it appear transparent if you feel bothered by it. The floating window provides information on your ongoing Broadband speed, let's say, you are using Skype for a video chat, you can instantly check the real-time floating window to see your current speed. If the upload > 60K/s and download > 100K/s, it means your broadband environment is in good shape, you would get high audio/video quality. Even when you are watching online videos, you can verify your speed status via the floating window. Click here for further details. Though we try our best to make our software most advanced and effective, it is still a work in progress. Therefore, there maybe some program bugs and we strongly advise you to proceed with caution. If you love Net Guard and feel it could possibly be beneficial to you and your country, kindly assist us in translating it to your native language and as a token of gratitude, we would like to list your Name/Website/Email Address on our special thanks list. Should you wih to keep your personal information confidential, we will exercise utmost respect to your privacy. You may email us at support@cucusoft.com and we will contact you accordingly. Windows XP, Windows Vista, Windows 2003 Server, Windows 7, Windows 8. If you want to check which program or application is taking advantage of your Broadband and how much traffic it generates, kindly refer below. 1. Please click tab "Net Monitor" as shown below. 2. If you would like to determine the processes accessing the Internet, you can click button "2" as shown below. 3. If you would like to know the service processes acessing the Internet, you can click button "3" as shown below. 4. If you would like to check all the processes for each visited Internet, you can click button "4" as shown below. 5. If you would like to check all the processes that is visiting and all the other visited Internet, you can click button "5" as shown below. 6. In region "6" as shown below, you can see the processes for downloading or uploading in real-time speed so you can analyze which program or application is going to eat up your bandwidth the most. You can click the column head to sort them. 7. In region "7" as shown below, you can see the processes for downloaded or uploaded broadband usage. This provides information as to which program or application used your bandwidth significantly. You can click the column head to sort them. 8. If you find some suspicious process/program/application, you can use your mouse to right click on it and select "Kill" to terminate this process/program/application instantly. Here we give you an example regarding how to find an unwanted program which is consuming your bandwidth and how to stop it. Step 1: Please click the Column head as shown below, to sort out the received speed. Step 2: You can see that the top most is "PPAP.exe" as shown below, its real-time download speed is 507.3KB/s. It is quite busy in downloading something, and it seems like a P2P software. Thus, you want to stop its downloading activity. Step 3: Move your mouse on this item and right click your mouse, a "Kill" menu will pop up as seen below, click "kill", then the program/process will be terminated. Step 2. A Settings dialog box will pop up, please check "Enable usage alarm". Step 3. Input your bandwidth limit per month. If you are not sure about your bandwidth limit, you may ask your Internet Service Provider for more information. Step 4. Input Alarm Threshold. Once your broadband usage exceeds this value, Cucusoft Net Guard will prompt you a notification. Step 5. Click the "OK" button to save your settings. Step 6. You can verify the value which is available on the main screen. Please see the highlighted region as shown below. Step 1. Click tab "Net Usage". Step 2. Move mouse on any bar as seen in image #2, a bandwidth usage summary box will appear. You can check daily usage summary, including total downloading and uploading usage, top 3 downloading programs and top 3 uploading programs. 1. You can check the history data by clicking buttons #1, #2, #3 as shown below. Then the bar graph charts will show the data by year, month or week. 2. You can also click the button #4, #5 as illustrated below, to go to previous year, month or week. Step 1. Directly click on the floating window as shown below, today's real-time summary will pop up. You can check real-time bandwidth usage status, including the current total usage and the program that utilized the most downloads and uploads subsequently. Step 1. Right click on the floating status window. Step 2. Click on "Opacity". Step 3. Select the opacity value you prefer then the floating status window will become transparent accordingly.